LaGuardia is located in the state of New York and Newark is located in the state of New Jersey. Because of this, taxi drivers can charge a special rate. There are no trains or direct buses from one airport to the other. The best option is to book a car service beforehand, which is cheaper than taking a taxi. How to book a car service? Booking a car service online beforehand is not only cheaper but will save you a lot of time and stress. 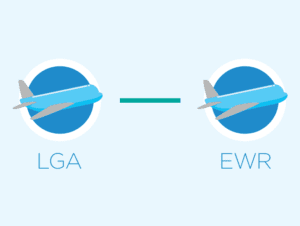 When booking this private inter-airport transfer from Newark Airport (EWR) to LaGuardia (LGA) or vice versa, you will need to fill in your flight details to complete your reservation.